Everyone has their idiosyncratic car fetishes, and for me it’s space utilization. That’s part of why I love mid-engine designs so much, especially on non-sports cars. It’s so hard to do right, but when it happens, the packaging becomes sublime. That’s why I’m so taken with these stillborn mid-engined Wartburg prototypes. If you even know about Wartburg at all, chances are you don’t think of them as being a particularly innovative company. Of the two major East German cars (the other being the Trabant), Wartburg was the fancy option, though it was still a three-cylinder two stroke based on an ancient DKW. 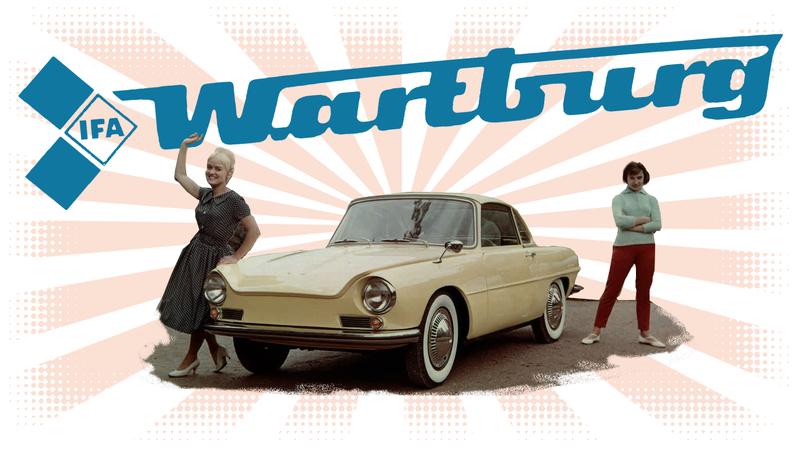 Wartburgs had really only two main designs throughout their life from 1956-1991: the roundy, ‘50s-style 311/312, and then later, in 1966, the unashamedly rectilinear 353. Both had the same basic layout: front inline-3, two strokes, driving the front wheels. That’s why this prototype, known as the P100 (sometimes called the 314, which would have been its model number) and dating from the early ‘60s, is so fascinating. It’s a completely different and daring direction from Wartburg, and that’s just not something I expected out of the staid-seeming company. The P100 prototype used a flat-four engine mounted in the middle, driving the rear wheels. This layout allowed for two trunks, like a Volkswagen Type 3, and is, of course, a marvelous packaging achievement. Exactly where that mid-mounted engine is is not all that clear, and I have yet to find any blueprints or cut-away drawings, leaving me to speculate. I assume an opposed engine was selected because those could be made very flat, making me wonder if an under-the-rear-seat layout was used. If so, that would make the Wartburg P100 similar to that other DOA triumph of packaging, the Porsche-designed VW EA266, which stuck an inline-4 on its side under the back seat. You can see that the block itself is very flat, but I imagine for an underseat location, they’d have to rework the intake manifold, unless they wanted to put a cushion on top of that air cleaner and call it an armrest. Still, as Volkswagen showed us with their Type 3 engines, such suitcase-like repackaging is possible. Also helping to corroborate an under-seat mounting is the fact that the transmission developed for the P100 project was later used for the front-engine/front-drive Wartburg 353. There was even a sports-coupé version of the P100 project, a lovely little thing called the 313-2. This would have retained the mid-engine layout, just in a sportier, coupé body. To me, it looks a bit like a mix beteween a Renault Floride and a BMW 700 coupé. I think it’s lovely. It seems of the four built, at least two of these survive! Some of the reasons given why the mid-engine approach was not eventually followed are essentially the same issues that affect most mid-engine cars: cooling issues, cabin noise, and engine accessibility. The cooling must have been especially tricky, since I see almost no air intakes on either of the prototypes. Maybe there was some sort of underbody scoop? Like pretty much every non-sporting mid-engined car, the carmaker once again backed down from the inherent issues of such an ambitious packaging plan. Today, there’s only really one mid-engined sedan on the market, the Tesla Model S. And that’s only if you count the rear-axle-mounted electric motors as a mid-engine, which I suppose you may as well. Even if they were never to be, these P100-series prototypes are fascinating, and show a daring, elegant side of the normally homely and staid Wartburg that I never knew existed.